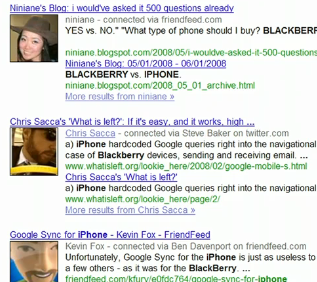 Google Social Search: Twitter And FriendFeed Highlighted. What About Facebook? Last week at the Web 2.0 Summit in San Francisco, Google’s Marissa Mayer took the stage for two reasons. The first was to formally announce the Google/Twitter search deal, but the second was the show off a new product: Google Social Search. The on-stage demonstration was interesting, but left a lot of questions unanswered. Today, the Google Labs experiment goes live, and we’ll get those answers. Social Search essentially pulls in information from social networks to augment Google search results. But a major question is: What social networks get pulled it? While the experiment isn’t quite live yet, it would seem that from the video below made by Google’s Matt Cutts, Social Search, at least at first, will be able to include results from Twitter, FriendFeed, Picasa, Blogger, and Google Reader. The last three are obvious since Google owns all of those. Twitter seems obvious too because of the new Google/Twitter search deal. FriendFeed is an interesting one though since Facebook bought that service in August. As expected, it doesn’t appear that Facebook data will play a big role in Social Search (if any), as Google and Facebook continue their social profile stand-off. Cutts makes it clear that public data is the key to all of this, and Facebook doesn’t exactly have the most public information. That’s too bad since Facebook is, after all, the largest social network. Cutts explains that the idea behind all of this is to utilize your “social circle.” The key to populating this social circle is your Google Public Profile. On this profile, the different social networking profiles you list yourself as being a member of will be a signal to Google to scour those networks for social data to serve up in its new results. Interestingly, in the second video below, explaining how Google Social Search works, a Facebook profile appears in the lists of profiles. But again, in all the experiments, no data from Facebook seems to show up. Google also uses your Gmail chat buddies to build out your social circle. When it’s live, you’ll be able to find Social Search here on Google’s Experimental search page. Update: And now it’s live.